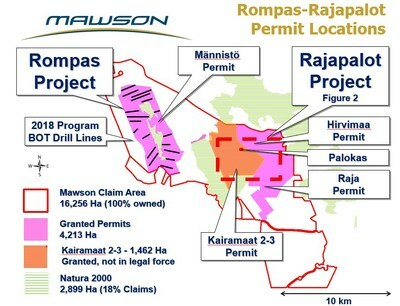 VANCOUVER, March 23, 2018 /CNW/ - Mawson Resources Limited ("Mawson") or (the "Company") (TSX:MAW) (Frankfurt:MXR) (PINKSHEETS: MWSNF) announces an update on drilling and rig movements at its 100% owned Rajapalot gold project in Finland. 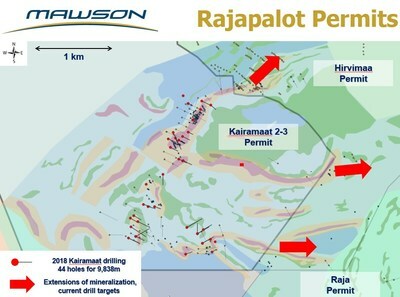 Mr Hudson, Chairman & CEO states, "Owing to a complicated Finnish administrative system we have had to complete drilling at Kairamaat 2-3 permit a few weeks earlier than anticipated. Three drill rigs continue to drill 24/7 in adjacent areas and we remain on target to complete 15 kilometres of drilling at Rajapalot this winter. 39 drill holes remain to be reported, so news flow will continue for the coming months. Our challenge is to now search for extensions of the mineralized system north of Palokas and to the east of Raja prospects and build up further targets for ongoing summer drilling."